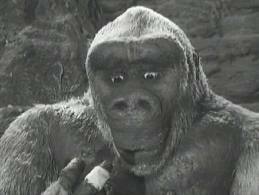 They knew how to ruin a franchise in 1933; The Song of Kong is, as the title suggests, on a much smaller scale that the original film, with much of Ernest B Schoedsack’s film given over to music hall songs and mild intrigue and the people of Skull island only get a look in around the midway mark. Carl Denham (Robert Armstrong) leads an expedition from New York in search of treasure, only to find Kong’s roly-poly albino offspring and a few dinosaurs lying in wait. Kong’s son Kiko is a friendly little monkey, and does what he can to protect Denham’s bedraggled party from the island’s inhabitants. Complete with a splendid music number performed by monkeys, The Song of Kong is a delightfully silly affair, a lights dessert after the dramatic beat of the original monster-on-the-loose movie. Marking an abrupt tonal shift in the adventures of sentient robot Johnny 5, this sequel pitches him into the bowels of an unnamed city where is talents are exploited by ruthless diamond thieves. Ally Sheedy contributes a phone message and Steve Guttenberg doesn’t appear at all; instead the focus is on Ben (Fisher Stevens) who partners up with Spinal Tap’s Michael McKean to mass-produce a range of Johnny 5 toys. But their warehouse space is also inhabited by crooks, who plan to use Johnny for a heist. 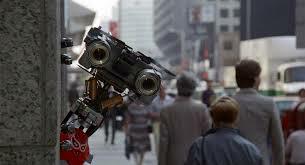 Short Circuit 2 doesn’t have the same gravity as the first film, but it’s a brisk family entertainment, and engineers a beguilingly odd, off-kilter pathos as Johnny is bumped and bruised by city life before emerging victorious with a Tarzan yell; his ability to consume and regurgitate pop-culture ephemera makes Johnny 5 a somewhat prescient figure in a pre-internet world. 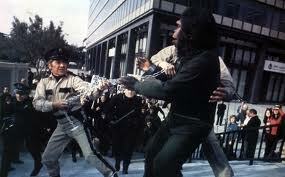 The development of the original Planet of The Apes franchise is an oddly haphazard one. The twist of the original film is so familiar it dulls the impact, the second entry (Beneath…) puts a full-stop on things by having Charlton Heston’s character Taylor blow the earth to smithereens. Charged with continuing the franchise, writer Paul Dehn ingeniously sent the apes back to 1970’s earth for the serio-comic Escape, allowing him to reboot the story from the start with 1972’s Conquest, which sees Cesar (Roddy McDowell) leading an ape revolt. Covering similar ground to 2011’s Rise, Conquest offers up a tricky racism context for the revolt, made all the more striking by the use of LA’s Century City shopping mall for the climactic massacre. Strikingly on-the-money, Conquest is a troubling and thoughtful entry in the series, although 1975’s Battle did little to further the ideas involved.